This is THE chocolate chip cookie, by the way. 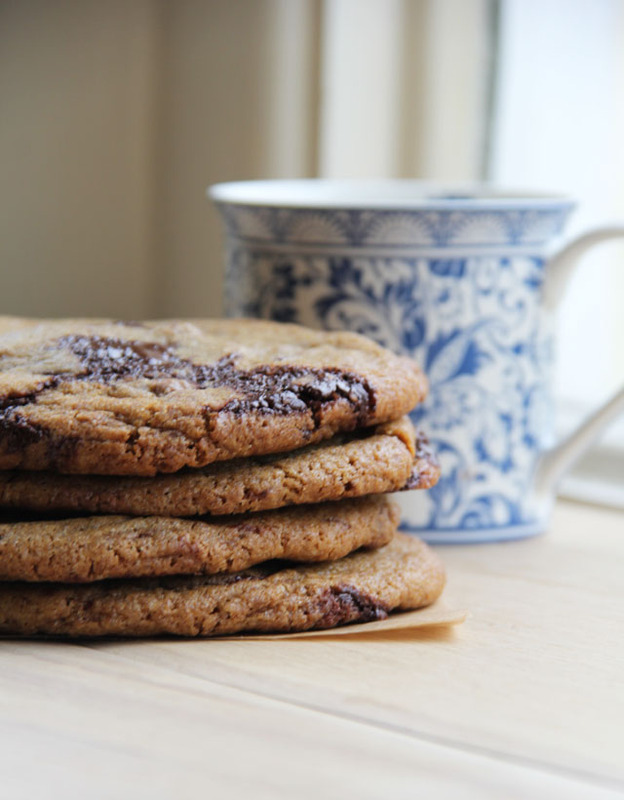 Forget the ultimate soft, chewy, crunchy, snappy, chocolate infused ‘cookie’ and just think about THIS cookie. This cookie doesn’t have an ultimate quality within it; it is simply THE ‘one’. Much like but *slightly* differing to the love of your life, your favourite pair of jeans that never seem to ever ever get tight (but never say never, right? ), the Lost series, the Homeland series, Modern Family, that mug in the kitchen that no one daren’t sip their tea from, your first pet (yes, even cats). You get where I’m going with this I hope? I stumbled across this precise, accurate, bordering on scientific jargon slash recipe back in January when I received this HUGE box from Amazon in the post. A couple of knives and mounds of cellotape later revealed the most beautiful red ribbon, a hardback copy of Bouchon Bakery Cookbook, and a festive little card from my manager at Fair Cake containing the most encouraging and thoughtful words I have ever read. Bouchon – a small chain French bakery in America published this book to give its customers a taste of what happens beyond the counters. The methods are strenuous and are mostly written for those who own a convection oven but they still work beautifully. 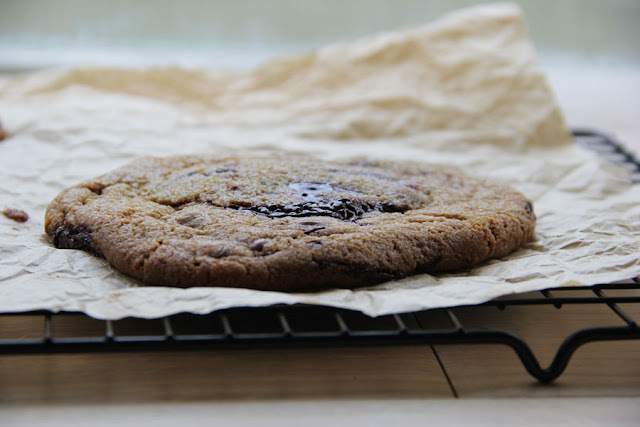 But If I didn’t have a crappy fan oven, then my cookies wouldn’t have spread out so large! I chilled them and everything! The cookies weigh in at 150 grams each… that’s 2 in at a time, 20 minutes each totaling to 1 hour 10 minutes of baking time. What’s that you say? That cant’ be that many cookies then? Sieving chocolate chunks will remove shavings that tend to 'darken' the cookie once baked. In a large bowl whisk together baking soda, salt and flour and set aside. In a small bowl add the dark and granulated sugars, pour in the treacle and stir away all the lumps - I prefer to use my hands, they do a far better job at dissolving the lumps. 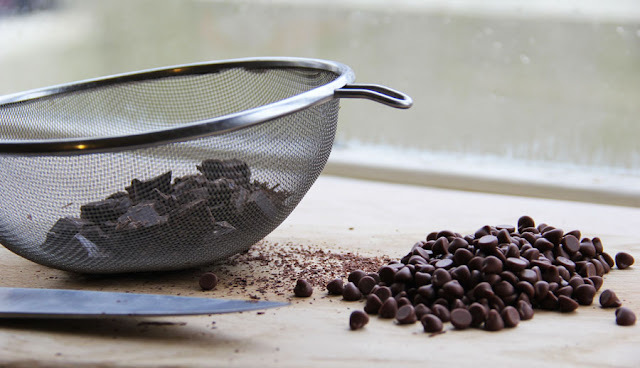 Over a chopping board, sieve the chopped chocolate to remove the little shaves and then stir chocolate chips into the sieve. Set aside. With a mixer, beat the butter for 4 minutes until very pale and soft. Add the treacle mixture to the butter and mix for a further 4 minutes until fluffy. Slowly pour in the egg and mix for a maximum of 30 seconds - any longer than this and the cookies will spread when baked! Add the flour mixture in two parts, mixing for a maximum of 15 seconds each time. The flour should be just combined. Fold in the chocolate with a spatula until well incorporated. If you're using a freestanding mixer, pulse the mixture 10 times. Meanwhile, preheat the oven to 162 degrees C / 325 F and line a baking sheet with parchment paper. Divide the dough into 150g portions and roll each into a ball. Depending on the size of your baking sheet, bake 2 cookies at a time making sure they are spaced well apart (see top picture for an idea of how to position the cookies in the oven). 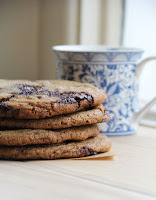 Bake for 20 minutes each time - 40 minutes overall for 6 cookies. Transfer to a cooling rack for 10 minutes and then dig in! 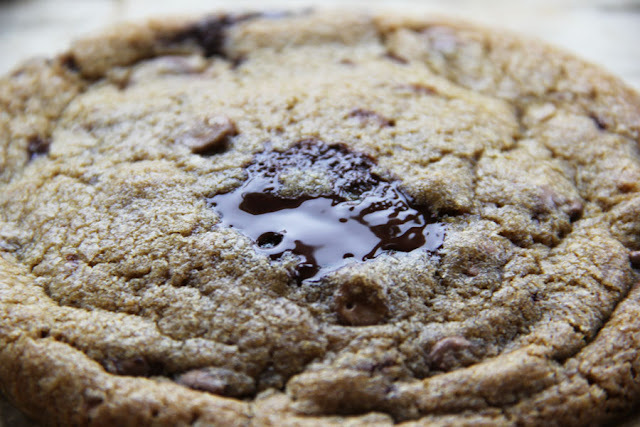 Do you have an ultimate chocolate chip cookie recipe? And just like your favourite jeans that always fit, you should never ever give them to anyone else right?! That's exactly right, I hid these in Tupperware....in my car! Never a bad thing when cookies turn out huge, it's more yumminess for my tummy :) Love the oozy pools of chocolate fresh from the oven. Oh jo, those oozy pools made my mouth water so. Much. The bigger the cookie, the more there is for you I suppose! This makes me so sad I don't have any fresh cookies at work - they'd go down really well with a cup of tea right now! 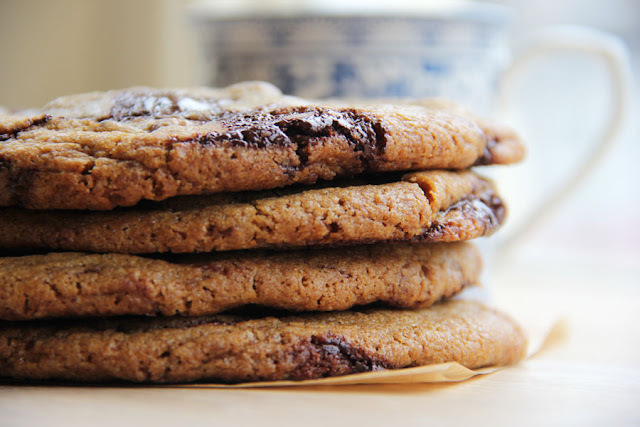 Cookies are one of my favourite things to bake because even though they are simple, everyone loves them. I can't get over the big chunks of melted chocolate! Hoarding chunks and chocolate chips to the recipe makes a difference, I think next time I'm going to make them smaller though! I think the Bouchon Bakery book is the most beautiful cookbook I have ever seen! And these cookies look amazing! What could I substitute for black treacle, or can I omit it? Thanks! it really is a beautiful book! wish it wasnt so heavy though. i deffo wouldnt skimp on the treacle. 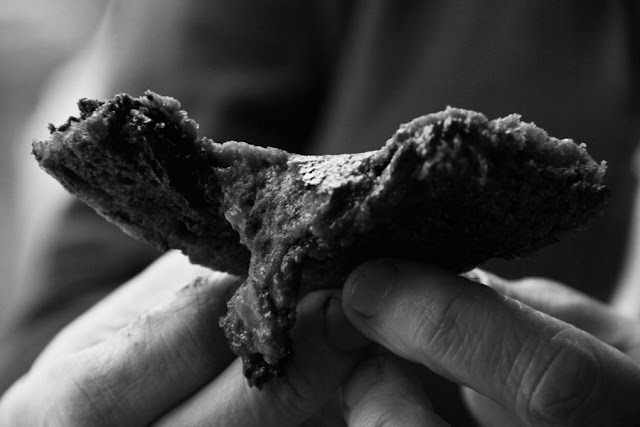 the original recipe actually calls for molasses! but the closest i could get to molasses without spending 5 pounds was treacle! if you dont have this either, i would suggest maybe dark brown sugar with a touch of golden syrup? hope this helps! Saw your comment on my post. These look delicious! Love the big chocolate spots.